Enroll now and learn how to creatively reuse digital cultural content from professionals of the Europeana Space network. For the second academic year, the E-Space MOOC “Creative with Digital Heritage” is accepting enrollments. 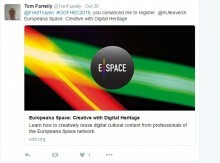 Europeana Space was a EC-funded project about the creative reuse of digital cultural heritage, which concluded in March 2017 with “excellent” evaluation from the EC reviewers. On the framework of continued activities of the E-Space network beyond the end of the funding pèeriod, and after the great success of the first run in 2016-2017, this MOOC is repeated. The educational idea behind the E-Space MOOC is to lower barriers to the access and reuse of cultural heritage content on Europeana and similar sources. 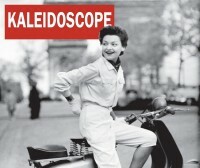 Whether you are a student or teacher with an interest in cultural heritage, a GLAM professional, a developer or simply a cultural heritage enthusiast without prior technical knowledge, this MOOC is for you: how can you engage with and reuse the wealth of digital cultural heritage available online in many repositories such as Europeana? How can you become an active user of this content, using, remixing and reinventing it for your research, lessons, and development? The course is free and requires an effort of 2-4 hours per week, over a 8-weeks lenght. The course is available on KU Leuven section at EdX platform.